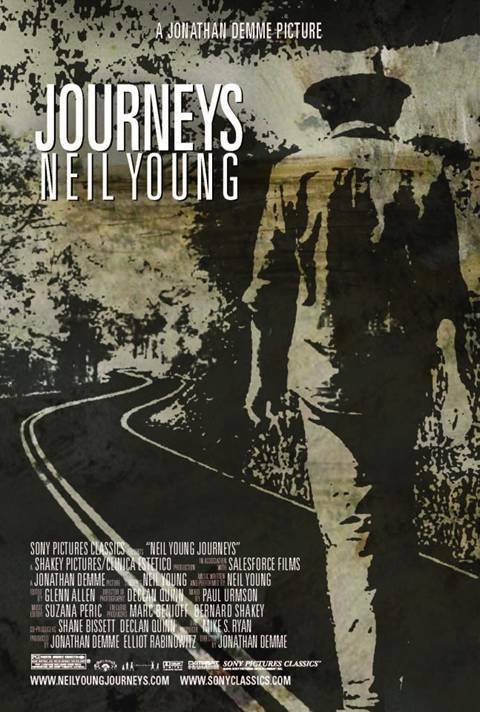 The film "Neil Young Journeys" will be released on Oct. 16 on DVD and Blu-ray and can now be pre-ordered on Amazon.com. 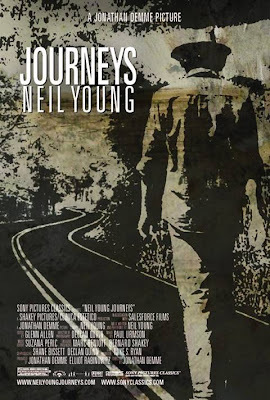 Blu-ray and DVD includes three featurettes: “Making Journeys;” “Journey to Slamdance: A Conversation with Neil Young & Jonathan Demme,” a Q&A discussion filmed at the Slamdance Film Festival; and “The 92nd Street Y Talks with Neil Young & Jonathan Demme,” providing a closer look at the enduring collaboration between Demme and Young. Here are two previously unreleased tracks: “You Never Call” and “Leia” on The Music Mix | EW.com. 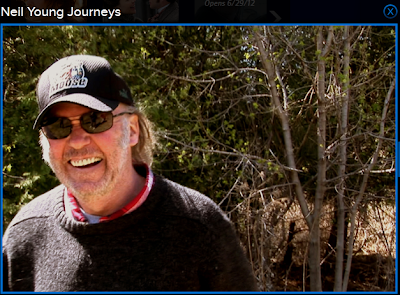 More on Neil Young Journeys Film Premiere. Okay, I'll be the first to ask, since I've been wondering for awhile. When WILL "Trunk Show" be released on DVD? I had that question for Neil & Demme at 92nd St Y during the Q&A, but they never got to it. A great intimate view of Neil & company from 2007 that cannot be missed - even the 14 minute long "No Hidden Path" is an exhilirating rush. You can't actually preorder at that link, and there's no listed release date. All I want for Christmas is a Truck Show DVD! NICE! Finally get to watch it them head to Omemee to find everything on the video! I think I just peed a little. I knew the first Comment would be "what about Trunk Show"! Great news about Journeys; hope this means that Trunk Show is coming out soon. The version that I saw (with Mr. Demme in attendance) had an amazing version of No Hidden Path, which provides the key point in the film...it's way, way longer than 14 minutes. Saw Journeys in the theater in NYC...not that impressed, just underwhelmed considering how great that tour was...Trunk Show was a great tour and a great film document...that being said, I should see both again to re-assess, but only will be able to see Journeys for the foreseeable future! this is great news! The bonus material sounds cool, but I wonder if there will be any extra songs that weren't included in the film. In particular, that solo electric version of "Cortez the Killer" is so beautiful. I was disappointed when it wasn't included (in full) in the film. Well, either way, it's going to be an awesome DVD to own. And I also feel the need to add to the chorus of people asking, "What about Trunk Show?" @Dan - yep, that's probably exactly where Trunk Show is... awaiting NYA#7 in 2048. @Mr H - nice to see you round here. No Hidden Path is just so epic and glad Demme managed to capture the essence. @cosplusisin - “You Never Call” and “Leia” are listed as 2 bonus tracks not in film. They can be previewed at link above. Thrash - "You Never Call" and "Leia" are most definitely in the "Journeys" film - you haven't seen it yet? What we were probably thinking was that the 2 tracks weren't on Le Noise and are considered unreleased songs. By the way, wish "You Never Call" could have been set up a bit better in the film - the person I was with, who didn't know the backstory, though it was the goofiest thing he ever heard. And I'm sure that photo of LA and Ben went over a lot of people's heads. yea, what about Trunk Show ? Ive been jonesing for that for a long time. In the same vault as the CSNY concert photage I saw being shot at CSNY2K and later tour. NY, release this stuff already, it wont mean youre dying soon. CSN may even want the $$.